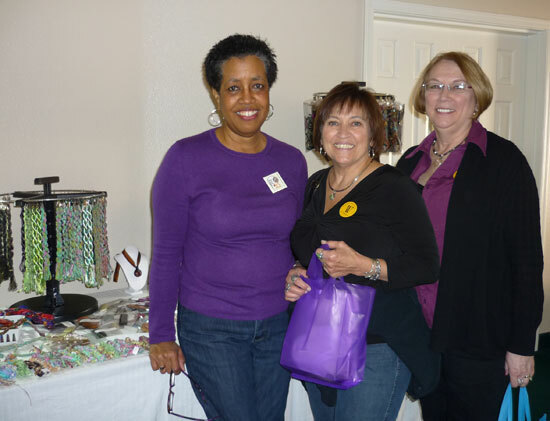 Beading Arts: Trekking to Tucson! A guest post by Michelle Buettner, in which she shares memories and photos from her trip this year to Tucson. Thank you Shelly! Tucson was a trip this year! The 2011 Annual Tucson Gem and Mineral Show that is! “Tucson” (as the group of shows are so lovingly referred to) is actually 40 or more shows spread out all over the city. As the world’s biggest annual event where you’ll find the latest and greatest trends within the jewelry, gem, and fossil industry - this year’s event Sparkled! I tell people that, for me anyway, it’s like “Disneyland on Steroids for the bead / jewelry addicts of the world”! (I have a feeling I might not be the only one who feels this way.) Having lived in Tucson for several years and now, still being only a short 2 hour drive away, the excitement and anticipation of attending each year is almost overwhelming! With temperatures below what the city had seen in quite some time, there were many frozen water fountains and bathroom pipes, not to mention frozen beads, gems and jewelry findings! 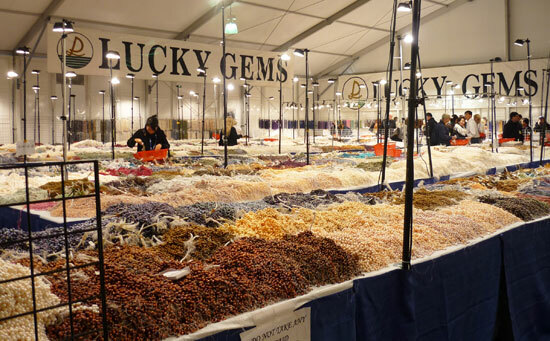 Okay, okay…so there weren’t really any frozen gems and beads…those were actually the HOT items in Tucson this year and, despite the colder temps, folks from all over the world were buzzing around the city – taking in everything it had to offer. The trend towards base metals like copper and brass, as well as colored craft wires and other items of this sort has been on the rise for the past two or three years during the Tucson shows, but due to the drastically rapid rise in silver and gold prices recently, alternative metals seemed to shine a bit more brightly this year than in past. 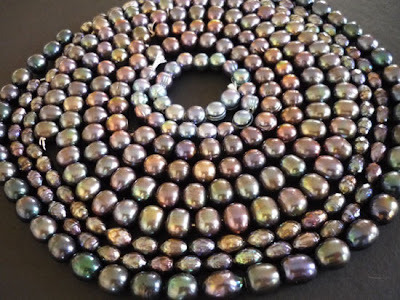 Not only were there alternative metals at every corner this year, but ribbons and cords of all textures and colors as well and beads in various materials were all the rage, too! The trendiest materials this year seemed to be Lucite (or any plastic bead), anything ‘vintage’ and ‘antiqued’, eclectic materials (think steam punk, watch parts, etc. 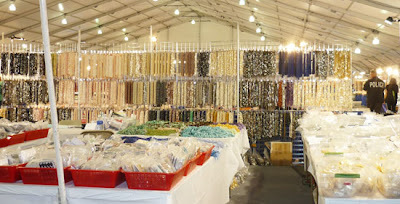 ), resin, and everything ‘cloth’ (ribbons, fabrics, yarns and cords)! Favorite colors this year were various shades of pinks (“Honeysuckle” if you follow Pantone’s color guide), bright blues/purples, yellows/browns and neutrals of blacks/grey/white’s popped up in everything from pearls to fabrics, too. When I asked some of my fellow jewelry crafters about their various supply choices this year, they told me that not only are these items easier on their bank account than materials in precious metals, they’re very fun to work with and really allow you to mix your styles and designs up a bit and create things that are not ordinary and “stamped out” like everything seen in stores these days. Many of the items I picked up this year were in the above categories as well – including some great ribbons from Connie, “The Fiber Goddess”, over at The Diva Cord Maker. Here’s Marsha and Janet, my fellow “bead partners in crime” with Connie in her room at the Whole Bead Show at the Windmill Inn. Don’t they look happy? With all the excitement that Tucson brings, there are some challenges (fun ones!) in attending too. For instance, it’s tough to know where to go for all it is that you “want and need”. I mean, you want to go and do it ALL, but realistically that’s just not possible. I suggest getting the Jewelry Show Guide (Published by Interweave Press) prior to attending because it will help you find ‘what’s where’ and will eliminate the need for driving (or taking the bus routes) to places that don’t have exactly what it is you want to see. Take my word for it – it’s a very useful and time-saving tool! 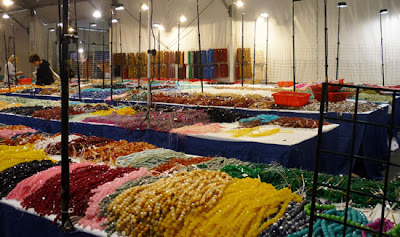 Tucson, or the “annual trek to the drool fest” as I dubbed it, is definitely worth planning and saving for and is something that every jewelry, bead, and gem person should experience! So, plan ahead and take it one step at a time because you know you wouldn’t want to miss one single, beautiful bead! 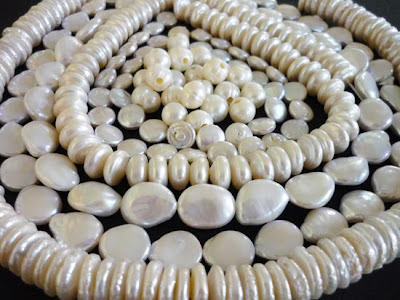 Michelle Buettner holds a Graduate Pearls Diploma from the Gemological Institute of America (GIA) and along with designing jewelry, she also designs handcrafted earring wires and findings for other jewelry designers. She teaches jewelry classes in and around Arizona, has taught classes for various bead shows during the Tucson Gem and Mineral Show and laughingly admits to regularly dreaming of pearls, beads, wire and jewelry while she sleeps! 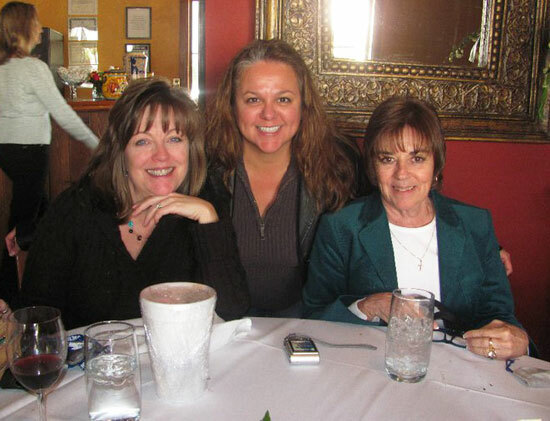 Cyndi - Thanks so much for allowing me to chat about my Tucson experience this year. I really hope you can join me next year - it's tons of fun! Shelly, I appreciate the time that you took to write this up and share it with us!